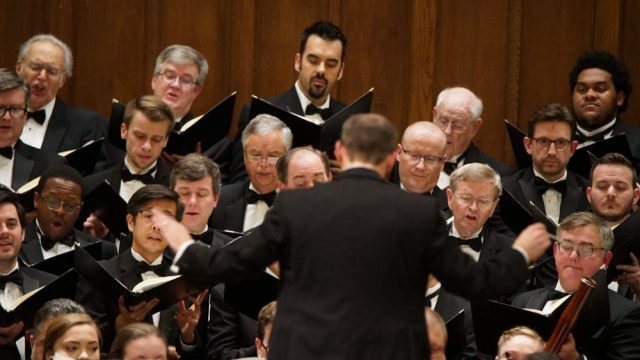 Pictured: The Charlotte Master Chorale conducted by Kenney Potter. Photo courtesy of John Cosmas. Kenney Potter conducted the first portion of Charlotte Master Chorale’s “Messiah” Friday as if the ice storm had already begun to howl at Charlotte’s borders, and he wanted to make sure everyone at First United Methodist Church got home before the roads froze. After intermission, he occasionally slowed down and found welcome moments of gravity (“He was despised”) and tenderness (“I know that my redeemer liveth”). Most of the time, though, he led Handel’s score with unvarying brisk intensity. Was he afraid to bore a crowd too familiar with the piece, if he relaxed the tempos of the big choruses? The evening had a “hurry-up” quality, from the cutting of seven less-famous numbers (none in the best-known “Christmas” portion) to the abridgement of “He was despised” to the way soloists came on and off: They walked to center stage as the N.C. Baroque Orchestra played the end of the previous number, then walked away as soon as they’d closed their mouths. Potter set the tone from the overture, which was lean and fleet, and this approach had benefits and drawbacks. On the positive side, it let soloists cope with long, florid passages in one breath. It showed off the chorus’ pyrotechnic skills: No matter how fast they went, diction and division of notes stayed clean. Numbers that required rage, terror or exuberance came off well. But mystery, bliss, serenity and reflectiveness were almost nowhere to be found. And however adroitly the chorus coped with the challenges Potter set, they focused so hard on singing correctly that they couldn’t supply emotional nuances. In “Lift up your heads,” they delivered the greatest news in human history (assuming you’re a Christian) with bland jauntiness. The four soloists made strong impressions. Soprano Awet Andemicael conveyed luminous joy in a zippy “Rejoice greatly” and exultation in “I know that my redeemer liveth.” Tenor David Vanderwal brought wild-eyed fervor to “Thou shalt dash them,” and baritone Jesse Blumberg made “The trumpet shall sound” majestic and not a moment too long. Here Potter’s quicker-than-usual tempos, abetted by valveless trumpet solos by Doug Wilson, breathed fresh life into the eight-minute number. I am used to the sound of an alto: I grew up on Colin Davis’ 1966 recording with the London Symphony, still the best of the dozen I’ve heard, where Helen Watts sang the numbers allotted this weekend to countertenor Timothy Parsons. Yet I admired the fiery delivery and daring ornamentation of Parsons’ “But who may abide,” a highlight even at top speed. By the way, the storm really will affect Sunday’s performance. Saturday’s concert at First Methodist will proceed at 7:30 p.m., but the performance scheduled for Sunday at 4 p.m. at First Baptist Church of Gastonia will take place Saturday at 3 p.m. at First United Methodist Church of Gastonia. That one will now offer only the Christmas portion plus the “Hallelujah” chorus. The audience was handed music Friday and invited to sing the latter, so warm up before you go.